» News » What’s on the table? When it comes to the twists and turns of local policymaking, just about every fall sees a key set of decision points. Unlike the spring season, when the annual budget tends to dominate the action, fall is a traditional time to set policy and direction. For the towns of Chapel Hill and Carrboro, this fall is no different. The roads taken in the coming months are likely to have very significant long-term impact. The biggest item early on for the board of aldermen is the Sept. 7 continuation of a public hearing on the latest proposal for Smith Level Road. Mayor Mark Chilton has been leading the charge for the latest compromise with the N.C. Department of Transportation. The project, which would add bike lanes, sidewalks and a median to the road, has been opposed by residents of the Berryhill neighborhood and others. 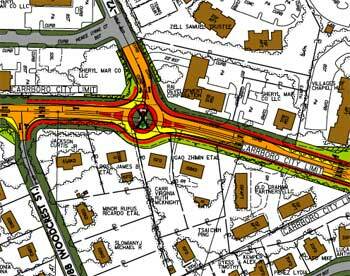 And NCDOT’s plan to acquire enough of an easement to further widen the road has left some board members uneasy about the plan. Board of alderman member Dan Coleman said he’s unsure if the board can finish work on the agreement this fall, but hopes the talks will end with an approved plan or an effort to arrive at one. Coleman said Chilton deserves a lot of credit for getting the two sides as close as they are, but that details, like how much clearing would be involved, still remain to be settled. “If they’re buying right-of-way but not building a road, why clear it?” Coleman said. Also on the aldermen’s agenda for the fall is the hiring of a new town clerk and the continued build-out of the town’s bicycle and sidewalk infrastructure, including sidewalks along part of Rogers Road. Greenways will be reviewed in the coming months as well, including the plans for the Morgan Creek Greenway and the first phase (1b) of the Bolin Creek Greenway. The board is also planning for a public hearing in late September to review phases 3 and 4 of the Ballentine subdivision off Homestead Road. At the board’s urging, the project’s developer has added a small commercial area into the project’s design. And while the board stays busy, the town’s public works and fire departments have their work cut out for them this fall. Public works is coordinating the yearlong rebuilding of Weaver Street, starting with a series of meetings and one-on-one visits with affected property owners. Meanwhile, fire department leaders are planning to split the department in two, with the opening of the town’s new fire station on Homestead Road scheduled for early September. Library services will continue to figure high in the Chapel Hill Town Council’s priorities this fall. A series of discussion points produced by a joint work group and sent to county and town officials last month drew criticism from some council members, who said it seemed to reflect the county’s priorities and didn’t go far enough to bridge a funding gap that’s been a bone of contention for the past several budget cycles. Mayor Mark Kleinschmidt said recently he’d like to see some kind of agreement reached with the county before the end of the year. Town Manager Roger Stancil said one aspect of library funding will be high on the council’s agenda when it reconvenes on Sept. 20. That’s when a vote is scheduled on the sale of bonds for a $16.5 million addition to the Chapel Hill Public Library. Bids on the project are expected to be ready by the end of the year. One of the main efforts in the coming months, Stancil said, will be designing a procedure for updating the town’s comprehensive plan, the first major re-write in a decade. He said planners are working on methods to collect input and residents’ views on the town’s future. Density issues and ways to diversify the tax base will be among the questions the process will address. “It’s time to have that conversation,” Stancil said. One issue that will be front and center but not on the council’s agenda – at least for now – is the relocation of the men’s homeless shelter. While the relocation remains one of the bigger issues in Chapel Hill, Stancil said the review of the special use permit for the project won’t come before the council until much later in the calendar. That doesn’t mean that it won’t come before the council through petitions and public comment, but Stancil said much of the discussion on the project this fall is likely to take place at the advisory board and staff level as the application goes through the review process.